When I wrote about the new Club World catering last week, I mentioned that I had also heard some interesting news about Club Europe changes. I wanted to get some additional confirmation before I wrote about it, and luckily the Club Europe crew we had on Sunday were happy to oblige. I should point out that whilst the gist of this article appears to be correct, the reasoning for why British Airways is doing it is more speculative. Why is British Airways apparently about to cap Club Europe at seven rows? I have written a couple of articles recently about changes to short haul service being driven by the ‘densification’ of the short haul fleet. What is happening is that the rear toilets are being removed and moved into the back wall of the aircraft. Additional rows of seats can then be installed in their place. BA is also taking the opportunity to introduce a super-slim no-recline seat with a 29 inch pitch which allows even more seats to go in. At the same, the first deliveries of brand new ‘standardised’ short haul aircraft are about to be made which will have a similar layout. Identical planes are being delivered to Aer Lingus, Vueling, Iberia and British Airways, even though two of the airlines operate two-class services with full catering in Business Class whilst the other two airlines just sell the odd tube of Pringles to a one-class cabin. Unfortunately the story is that the new aircraft about to be delivered, and the refurbished ones coming through, do not have enough galley space. British Airways has already had to scrap short haul duty free due to the lack of space on these new aircraft and Club Europe catering is the next casualty. We already knew that BA was planning to cap Club Europe numbers – I originally mentioned it back in my January article. It seems that the limit has now been set at 28 passengers, ie seven rows. The recent stories we have heard about a further ‘refresh’ of Club Europe catering do not appear to be caused by poor reaction to the last set of changes. It is being driven by a more fundamental problem – British Airways cannot operate the current tray-based Club Europe food service if it is to sell more than 28 seats. This is a tricky problem which is going to take time to resolve. In the short term, my understanding is that British Airways will cap Club Europe at seven rows on flights where a new or refurbished aircraft will, or could, operate it. This will allow the food service to continue to be tray based with the existing crockery. The way forward is more complex. The trays could be removed completely, with crew putting a table cloth on your drop-down table and manually laying out the settings. Alternatively, smaller items of crockery could be introduced to reduce storage space – the new mugs are particularly large as you will have seen. We will have to see what BA’s creative teams can come up with. This experiment will also inadvertently give British Airways some interesting insights into CE demand. Can it sharply increase Club Europe pricing now that seats are rationed? Will it hold back seats to sell to last-minute buyers of long-haul tickets looking for a CE connection? How many people will choose to trade down to Euro Traveller and how much will they pay? There is lots of learn – and perhaps BA will even decide that capping Club Europe makes sense long term. 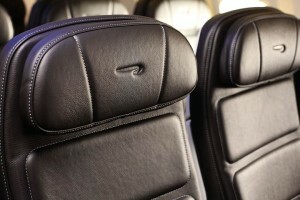 Is there a new BA CW seat on the way or am I mis-remembering? Any news on this? Coming when BA receive their a350’s.. but no news yet about design. I used to commute back and forth from Basel quite often and remember seeing 18 row’s of CE rather frequently. That loss in review by cutting capacity by 2/3rd will hit their top-line no? Although for every two business they would sell 3 ecomomy of course. Plus some bags.. The maths is quite fluid especially with expensive peak school holidays, weekend flights and low cost business fares..
OT but seat related. Flying to BKK next month in WT and there’s a lack of pairs of seats. Have paid for two seats in a row of three at 20 A&B. There are 2 pairs – 16 A, B, J & K by the bassinets which are greyed-out. Just wondered if they ever become available to purchase if they’re not used by people with babies, anyone know pls? I think they are released at T-24 on BA if no-one else has booked them. If you check them on seatguru.com it might tell you when those exact seats become available. OT – would anyone have the link to apply for the Gold Credit card? It seems headforpoints community know more than 3 different BA ‘customer service’ agents. I contacted BA and was fed wildly incorrect info by an Indian call centre. I complained, but found the correct info on this site. 3 weeks later I received complaint response from Indian customer service office, giving MORE wrong information. So complained again. Now I have received admission from another agent admitting they do not know how to get the correct info, and that appears to be case closed in their eyes. I’ve also spoke to Virgin Atlantic customer service agents a few times this year and they have been great, resolving queries immediately! Our CE flights to Valencia have only 5 rows in CE when I look at both the outbound and return. Leisure route? All the LGW flights to the south of Spain that we have taken have been absolutely packed in CE with about 10 rows. Oh. Wonder why this one is only 5 rows showing. Also going from LGW. Simply put, no they aren’t.